How many people would in any way enjoy spending, as I just have, £904.27 on a car repair? "We hope you found our customer service to your complete delight..."
Well, no, actually, 'complete delight' doesn't quite capture the thrill of spending 15 minutes sitting watching Countdown as I wait for an invoice that will put a bigger dent in my finances than a modest family holiday. While I can understand why a publicist like Pete 'Screaming headlines' Wilby might choose to describe a a band as 'internationally acclaimed' rather than 'once did a gig in Belgium’ (read the post!) I think any organisation that is so heavy handed in its desire to be positive deserves ridicule. "We hope that you experienced excellent levels of service to warrant 5 out of 5 in all areas." The English is as ugly as it is puzzling. The question has no context, there is nothing to suggest why I should rate service on a scale of one to five. Grabbing for superlatives and inflating words way beyond their natural meaning doesn't help anyone, least of all those struggling to argue that there is some substance in corporate communications. It's taken from a useful piece by John Lloyd in the Financial Times headlined The Truth about Spin and discussed by Neville Hobson. Neville takes the argument forward, suggesting social media has a role to play allowing politicians to speak directly without the filtered spin from PRs and journalists. ...most PRs and journalists add little value to truth-telling if they’re nothing more than channels or conduits who distort and manipulate the original message. ... If you want to get close to the truth, cut out the middlemen. Let the citizens make up their own minds as to what is truth. This is all very well, but it disregards two important functions, one of journalism and one of PR. Journalism aggregrates information from a variety of sources and orders it a way that is interesting and enteraining for the reader; this takes time and skill. To expect the average reader to go to original sources is akin to suggesting we plant, grow and harvest all our own ingredients before preparing lunch - fine, but most of the time I'd rather pick up a well-made sandwich. Likewise, one of the most positive roles a PR can play is interpreting and explaining sometimes dry and complex messages for a wider audience (including journalists), and often, certainly in business, on behalf of people who would struggle to express themselves in a lucid and engaging manner. Neville puts forward David Miliband as an example - he is a skilled communicator who knows as much about the presentation of messages as most PRs. But do we really learn a great deal from his blog? And is it of any interest to the person on the proverbial Clapham omnibus? I've just filled in the For Immediate Release survey. I don't suppose that Nev and Shel really care what an academic thinks - but did they really have to make me tick a box that was labelled "Non-communicator...."???? I didn't fill in "Anything else you want us to know? (Open-ended question; optional)" either - I don't suppose it is useful to know that I would prefer to FIR to be 45-minutes long so it fitted exactly (on a good day) my drive into work. Deep down, this does reflect one of my reservations about podcasting - namely, when do I get chance to listen? My routine is to download and burn to a CD and stick into the car changer. The trouble is, unless I spend ages editing it, it is burnt as a single track and, if my journey ends before the podcast I have no way of fast forwarding to where I left off. So I don't hear many shopws to the end. PS. Keep up the good work, H&H. Darcus reaches a disturbing conclusion: "Disaster looms." Time will tell, but it would be wrong to suggest, as he does, that one of the CIPR's slogans for the event was Don't Panic - that's the name of Nicky Wake's event management company which did a good job at Leeds, and for the University of Sunderland's Making the News conference. Are lies a big part of PR? Many PRs would be shocked by Max Clifford's assertion: "Lies are a big part of PR - I have always admitted that." Sorry, Max, but I don't think lies are part of ethical PR. But I do think it is very hard to argue that PR is grounded entirely on truth. 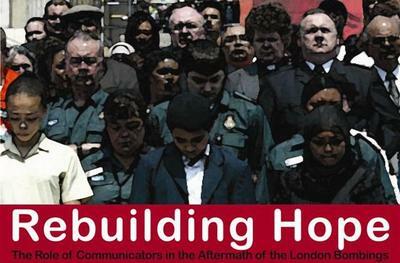 My contribution to the CIPR's challenging Rebuilding Hope conference, held in Leeds in the wake of the July 7 London bombings, asked 'Can Public Relations be a force for good?'. Presumably most of the delegates thought the answer to be a fairly unequivocal yes and that, as well as paying the mortgage, what they did for a living was also, in some small ways, making the world a slightly better place. On Thursday I am speaking at the CIPR Rebuilding Hope conference in Leeds, where PR practitioners will discuss issues arising from the London Bombings and 'help promote future positive communication and meaningful community relations'. There will be around 80 delegates from local councils, police forces, healthcare trusts, PR agencies and charities, mostly senior Public Relations professionals, as well as diversity, equality and regeneration specialists. After the conference at there will be an exhibition at Wakefield Media Centre and students from Leeds Metropolitan University will be producing a conference report. I have been asked to write a few paragraphs on what is needed to create ‘hope following the bombings’. which promotes dialogue between organisations and publics. At a time when the cohesion of our communities faces significant challenges, PR can play an important role, not only in relaying sensitive messages but also by listening to what is being said in our streets and in our mosques. If they are to be of value, these conversations must be honest and meaningful. They must relate truths, even when some of those truths are difficult to say, or difficult to hear. Handled with imagination, realism and sensitivity, such conversations put PR in a unique position to both encourage dialogue and inform policy. Stuart Bruce will also speak in Leeds.